The internet is without question one of the greatest inventions of our time. For the majority of users it's a great source of information - the good by far out-weighing the bad. But the bad is becoming more and more of a concern. When we first came across the hundreds of violent videos that had been uploaded to various websites, we were shocked by the senseless and excessive violence, the age of those involved and the lack of sympathy from those watching and those who used their mobile phones to film the incident and egg-on the attacker/s. No matter how many videos I witnessed during our research I was shocked and flinched, and still do, at the impact of the blows that rained down on the victims. Be it by foot or fist or weapon. Meeting and speaking to victims and their parents, like "Joe", from Glasgow in Scotland, who had no idea the assault on their son was on the internet for others' entertainment made our investigation all the more important. Joe had been bullied and assaulted by teenagers younger and smaller than him. "I couldn't run from them because they had knives and I was scared they would use them. They filmed the attack so that everyone at my school and people that lived in my area could see what they did to me." 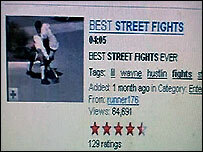 Over sixteen-hundred viewers watched his attackers taunt and punch him around the head on YouTube, the most successful video broadcast website. Yet no-one used the complaint system to have it taken down. We did and it was removed. Hayden Hewitt, the co-founder of LiveLeak, another site that allows its users to upload children fighting or attacking other kids, told me he would not take down the extremely violent videos we brought to his attention. He told us: "Look all this is happening, this is real life, this is going on, we're going to show it"
When I went to see Google, who own YouTube, their spokesperson Rachel Whetstone told me it was up to the community who use the site to flag up something if they thought it was inappropriate. YouTube would then decide if it breached its guidelines. Google are worth more than $170bn. When I asked how many people they employ to actively monitor the content being uploaded to YouTube, I was, and I'm sure many will be, surprised to learn that no-one actively polices the site. The police say this is not good enough and they want YouTube and other websites to actively police their content and forward details of those who upload violent footage so they can be investigated. If they were prepared to do this it may reduce the bullying and attacks for entertainment on vulnerable children, like Joe, overnight. We also investigated how the advertisements for blue-chip brands - including British Telecom, John Lewis, Carphone Warehouse and Orange - came to be splashed across an internet website called Pure Street Fights. These and several other brands all insisted that they had no knowledge of the adverts' appearance on the site and have launched investigations. Pure Street Fights, which features violent films of anything from vicious playground attacks to bare-knuckle boxing, is funded through its advertising. Other brands to have appeared on the site are VirginMedia, O2, eBay, Easycar and Peugeot. Michelle Elliott of Kidscape said: "It's outrageous. The only reason these sites are allowed to be up there is because somebody is paying money and the advertisers are paying money." However, the brands have all told Panorama that they knew nothing of the adverts - and have since ensured that they have been taken down. Almost all blamed rogue advertising networks for putting them onto the website. Both Carphone Warehouse and O2 have sacked the advertising networks responsible. Guy Philpott of the Internet Advertising Bureau (IAB), which represents online advertising companies, said that brands were often not aware of where advertising networks were placing their adverts. When contacted by Panorama, The Institute of Practitioners in Advertising (IPA) issued a statement. He said: "This is pretty lamentable isn't it? They (the brands) don't understand what happened in the chain for them to end up on this site. Online advertising is a fairly new science, you know, and it's grown a lot in the last couple of years. And there is an education process to be done." He said the IAB would be investigating the advertising networks in question. BT said in a statement: "The advert in question was placed by one of the many networks that BT uses that act as advertising sales houses for thousands of websites. "On the rare occasion that a network gets it wrong we will take immediate action. The advert in question was removed immediately it was brought to our attention. We take any breach of our guidelines extremely seriously and we are currently investigating with the network how this happened." Carphone Warehouse said in a statement: "As part of our advertising strategy TalkTalk buy mass online advertising space on third party online advertising networks. "Upon investigation, it transpires that one of our online advertising networks mistakenly advertised TalkTalk on Pure Street Fights due to a technical error on their part. This was a breach of contract and we immediately cancelled out contract with this network." Panorama: Children's Fight Club will be shown on BBC One on Monday, 30 July at 2030 BST.